Wouldn't it be great if we could tear down all the walls that divide us — racial, social, economic, and gender. The apostle Paul spent his entire life trying to do just that: to tear down the walls that divided people by bringing them to Jesus and the cross. There are no positions of superiority or inferiority at the foot of the cross, only a place for those who discover God's might displayed in sacrifice and God's love displayed even when under attack at the hands of human cruelty. 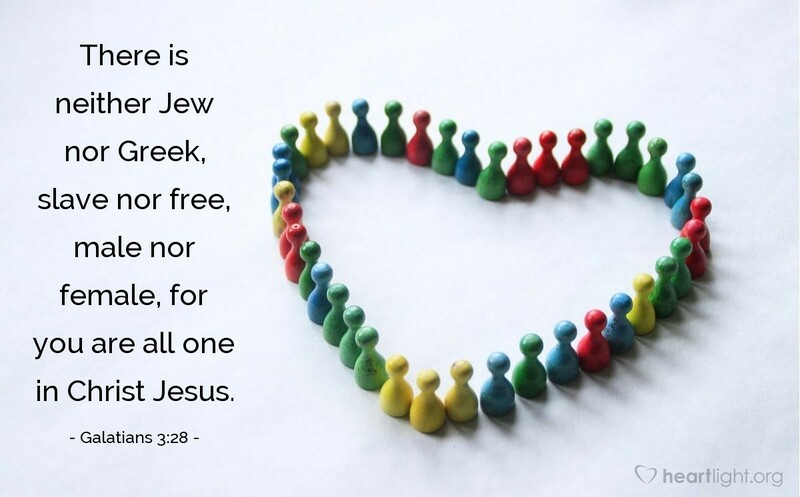 While the forces of culture and human selfishness are always finding ways to divide us, we must remember that in Jesus, and only in Jesus, can we be one. Forgive me, O God, when I have let prejudice and suspicion keep me from fully enjoying fellowship with those whom you have claimed as your children. I pray that my life will be an example of redemption and unity as I seek to love your children as you do. In the name of Jesus, whose dying prayer was for unity I pray. Amen.